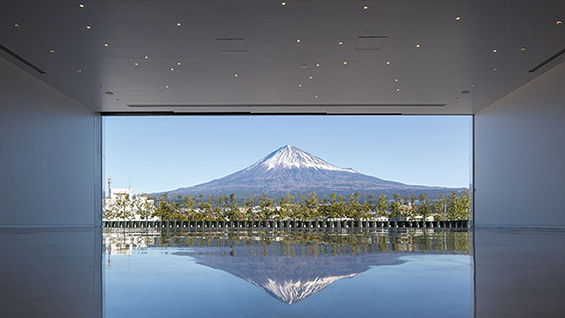 The recently completed Fujisan World Heritage Center in Fujinomiya sits opposite a picture-perfect view of the iconic mount Fuji. 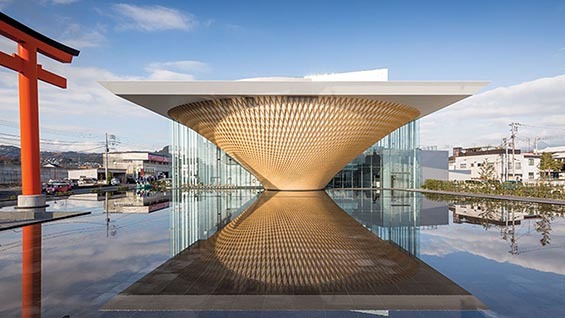 Designed by Shigeru Ban Architects, whose principal, Shigeru Ban (AR’84) describes the project as a “symbolic building” was erected in honor of the designation of Mount Fuji as a UNESCO World Heritage Site. The building, which features a wood lattice cone and reflecting pool, is at once a tribute to and meditation on the iconic mountain that is so essential to Japanese identity. The $33 million project functions as a visitor center as well as a museum that holds exhibition galleries, a movie theater, a café, library, lecture hall and administrative offices. With a ramp that spirals around the interior of the concrete cone of the structure, the Fujisan World Heritage Site echoes the geometry of Mount Fuji’s conic shape and alludes to the experience of ascending the mountain, with the structure terminating in a viewing gallery with a rooftop observation hall that perfectly frames the mountain itself.